A new generation of business leaders are asserting their capabilities and determination around the world. They comprise the post-millennial vanguard forging our global economy. Complementing and supplanting the European dominated hierarchies of the post-World War II era, they include Asian and Latino leaders. Taking advantage of leaps in technology and the homogenization of culture, they are borderless. They may be entrepreneurs, ambitious scions of established family enterprises or executives of multinational corporations, but they’re all enabled by the spread of free-market capitalism. Many are making their mark in high-tech and emerging sectors, while others are blazing new trails in traditional staples of industry. They tend to be young, with universal sensibilities. Despite the increasing redistribution of American business might to the rest of the world, many have important ties to the U.S. It would be impossible to put together any kind of objective list of these new leaders. Even empirical measures such as net worth-if they could be known-prove simplistic, because energy, ideas and potential are the most important currencies in this arena. Yet Chief Executive has identified a dozen individuals from around the world who clearly exemplify the new generation, their backgrounds, their attitudes- and their possibilities. Representing one of the world’s most dominant and dynamic new brands should be a piece of sopaipilla for Arebalos after dodging death threats as a journalist. But the 45-year-old director of communications and public affairs for Google in Latin America has the crucial task of serving as the face of Google in one of its fastestgrowing markets. Arebalos has mettle on his CV. As a Reuters reporter, the Buenos Aires native specialized in danger, covering the Medellin drug cartel in Colombia and the messy rise of Hugo Chavez in Venezuela. By 1997, he was its youngest regional editor, based in Miami. Cisco recruited him in 2000 to head Latin American public affairs. Arebalos looks up to John Chambers, CEO of Cisco. “He’s an excellent leader.” When he’s not traveling, he tinkers with new devices to enhance his hobbies of listening to music and watching movies. At 38, Adea CEO Bhattacharya has already crisscrossed the world in executive and top IT consulting posts. Now he is making Adea a rapidly growing force in the accelerating global IT-consulting industry, with revenues of $75 million and a staff of more than 1,000 landing and fulfilling contracts on three continents. Bhattacharya’s U.S. ties include a Nebraska-born physician wife. So he often surprises American business colleagues with his knowledge of college football, his cowboy hat and guitar, and performances of Garth Brooks songs. Son of a bustransport magnate, de Oliveira (who goes by “Junior”) is the billionaire Freddie Laker of Brazil. In 2001, he launched low-cost GOL Linhas Aereas Inteligentes (“Intelligent Airlines”) as its CEO and leapfrogged it past veterans such as American and Iberiato to the nation’s No. 2 carrier. About 10 percent of its passengers are flying for the first time, using a new key link to the continent’s economic centers. After dropping out of college to help manage the family company, de Oliveira saw an opportunity to convert Brazil‘s heavy long-haul bus traffic into budget airline passengers. So he purchased fuel-efficient, nextgeneration Boeing aircraft; pioneered a system for Internet ticketing that has become the airline’s operational linchpin; and motivated his workforce with one of the country’s first profit-sharing plans. The Sao Paulo-based company went public in 2004, providing de Oliveira with more capital for expansion. South American destinations have expanded to 60. Last year, GOL Linhas Aereas Inteligentes acquired and integrated venerable Varig (VRG Linhas Aereas). Varig recently added five European destinations and planned to launch flights to New York and Miami this year. At 46, Hoffman is an HP lifer, but that doesn’t mean he takes his job or his company for granted. In fact, the dedication he demonstrated to corporate goals and values since joining HP out of college 20 years ago helped Hoffman climb the ranks to the unique position he enjoys today as the com pany’s only senior vice president not based in the U.S. The supplies, image and printing operation Hoffmann runs is crucial to growth because he’s in charge of the high-margin products that keep HP’s millions of installed printers churning out billions of pages worldwide. Hoffmann lives in Munich because his family is well settled there, though it means more travel for him. Between flights and dinners at home, he trains for two or three triathlons each year. Early in his career, it became clear to Hsu that his birth in Taipei and childhood in the U.S. gave him a global perspective helpful to businesses. Now, the 33-year-old CEO of Symbio heads the largest software-outsourcing concern in China focusing on Western technology clients. Using reasonably priced engineering talent in second- and third-tier Chinese cities is one of his savvy moves. Hsu joined Symbio in Silicon Valley in 1998, when the startup was becoming an early outsourcer of software development to China, for blue-chip clients including Microsoft and IBM. He ran U.S. operations, then started a financial services division in Tokyo in 2000. Symbio’s China business boomed after China clamped down on IP pirates and got approval to join the World Trade Organization. Now global headquarters are in Beijing, and Symbio has 800 people on the mainland. Hsu co-hosts a weekly game of Texas Hold ‘Em for Western CEOs and Chinese venture capitalists. The latter “haven’t quite gotten the bluffing thing down yet,” he says. Senior vice president of global services, Kocher joined this B2B unit of the France Telecom Group three years ago with an eye toward helping transform the enterprise into not only the dominant business-network provider on its home continent but also a player in the North American market. Under his rising star, Orange Business Services became the premier provider to multinationals in Europe and Asia and is now competing against AT&T on its home turf. Kocher, 42, was always intrigued by technology, and began his career selling IBM hardware and software in Europe. Orange recruited him with the promise that he could help create the business market’s “shift toward the communications space-enabling people, machines and systems to communicate at any time, from anywhere,” as he puts it. Double-digit annual growth ensued, and much of Kocher’s task now is to acquire and integrate other operations into his Orange unit-including three French companies and one in India during the last two years alone. Kocher’s favorite leisure pursuit is so French it should come with a sauce: reading political philosophy. He also skis-sans books. 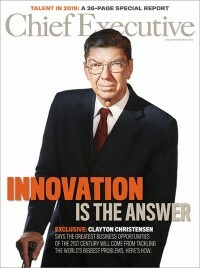 Three years ago, this research scientist- turned founder and CEO formed a venture capital company leveraging three major business trends into nascent commercial success: the aging of the massive corps of Western baby boomers, that generation’s growing preference for natural rather than chemical solutions to nutritional and medical needs, and the desire by university scientists and other innovators to commercialize such research. “I loved science growing up, but I was always more interested in commercializing it,” says the 42- year-old Markley, who has a PhD in life sciences. As an executive of a biotech startup, she ended up managing a spinoff enterprise that produces natural emulsions from oilseeds-and landed natural cosmetics giant Burt’s Bees as a customer. At the same time, Calgary-based Markley was nurturing Tech Avenue from scratch. Among other things, the VC concern is piloting a jaw-friendly tongue-retention device for snorers and is helping a biotech startup rebrand and relaunch a natural cold-sore treatment derived from geraniums. Given that SAP is ensconced in the relatively mature business of enterprise resource planning software, it might seem audacious of McBride, president and CEO of Asia-Pacific, to suggest that she can grow her part of the company to three times its current size by 2010. But the 47-year-old, self-described “transformational business leader” has achieved stunning goals time and again during her 24-year career with the German-based software leader. The New Zealand native and former frog researcher spent about a decade in sales with IBM in South Africa before jumping to SAP after meeting its dynamic co-founder, Hasso Plattner. McBride has since dramatically jump-started SAP’s growth about every three years in a different territory: South Africa and Namibia, New Zealand, the CPG sector in the U.S., the North American field business, and then Australia and New Zealand. “Don’t give me a business in a steady state,” McBride says. “I enjoy the challenges of being able to take business from a good state and making it high-growth. It’s semirepeatable; it’s about aspirational and transformational leadership.” And pulling that off, in part, depends on establishing three-year objectives and on paying a bit more for good people. McBride manages to satisfy her lifelong interest in zoology with frequent hikes from her homes in relatively untamed areas of Australia and New Zealand. Stratos Cofounder And CEO “Tony” Salas says he believes that his startup is the most promising company in one of the most promising industries on the globe: ethanol production. This Peru native and former agronomist launched Stratos on the bold notion that he can grow sugarcane more efficiently than anywhere else on the planet. Then Stratos can penetrate the growing U.S. market, where skepticism already is rising about corn-based ethanol. “If someone looks at where to put their money on ethanol, and how to grow the business, they’ll look at Stratos,” says the 40-year-old Salas. “We will be the most beautiful woman in the bar.” Salas received his undergraduate degree and MBA in the U.S. and was an international agronomy consultant before he joined the Peruvian government as undersecretary of agriculture in 2002. Then he came up with the proposition for Stratos: Grow sugarcane on a desert strip on Peru‘s Pacific coast, watering it with runoff from the Andes mountains. By creating farmland where there was none, the venture will be not only carbonneutral but actually carbon-positive. Salas got financing and is building a distillery that should be in operation yet this year. Then Stratos will be greeting customers in the U.S. Salas was a national amateur tennis champion several times, most recently when he was 31 years old. As director of engineering and operations, Bangalore Technical Center, Sarver is on the front lines of GM’s crucial efforts to expand its share of the rapidly growing car market in India. In 2003, the company moved the career engineering executive and U.S. native of Indian descent to Bangalore to launch its Indian technical center from scratch. Nowadays, more than 1,000 people staff the thriving GM outpost that Sarver established and grew. And last fall, it became the site of the industry’s first digital design studio in India. As the handpicked CEO of a century – old , $200-million icon of the Italian fashion industry, Trussardi has a lot on her 36-year-old shoulders. Not only has she been working to keep Trussardi and its brands on the cutting edge of global design during her three years as chief, but she also has been plotting the company’s expansion to the U.S. via a plan to smatter the East and West Coasts with high-end stores. Trussardi focused on creating a more flexible management structure and on adjusting its approach market by market to enhance the brands’ awareness abroad. She also got behind a not-for-profit group that is working to boost worldwide appreciation of Italy as a center of excellence for fashion design, food and art. Trussardi is a member of the Young Global Leaders group established by the Davos-based World Economic Forum. The irrepressible von Holstein, CEO of IQube, is a rising serial entrepreneur. He founded one of the world’s most successful dot-com companies and is now trying to apply a Midas touch to his latest idea: a new approach to startup incubators called IQube. Von Holstein’s notion for IQube is a variation on the idea that if you put enough monkeys in front of keyboards, you will end up with a novel. At his first IQube site, in Stockholm, von Holstein is nurturing 80 companies. He provides them all with back-office assistance and advice, expecting that a few may become successful. “I’m not smart enough to pick raisins out of a cake, so I eat the whole cake and therefore I get all the raisins,” he says. “Good entrepreneurs don’t need help as much as they need enough time.” Von Holstein, 45, says that IQube’s initial thrust is to help solve the problem of anemic entrepreneurialism in Sweden. But eventually, he plans to franchise IQube internationally. He knows what he’s doing. In 1996, von Holstein grew a consulting startup, Icon Medialab, to more than 3,500 employees in 32 offices in 21 countries. Accomplishment has allowed von Holstein some idle periods, including a few years spent skiing with his family in the Alps.